Multi-Year Fantasy Football Trophies. Free Engraving, Free Proofs. Quality Designs, Built to Last. Check out our great line of fantasy football trophies, we have something for every league and every budget. 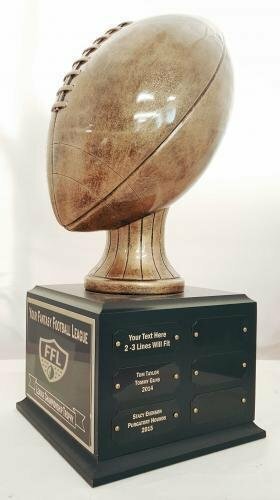 Fantasy football trophies can be personalized with your league logo, names of winners and updated annually. Do you need a Fantasy Football Trophy fast? These items are in stock and ready to ship. Check out our popular items: Armchair Quarterback Trophy, 36-Year Fantasy Football Trophy, 18-Year Fantasy Football Trophy, Lombardi Replica Trophy, and more! This is a 16" tall Fantasy football trophy. The trophy has a pressboard base (7" Square), painted black, with an Antique Gold Finished Resin Football. 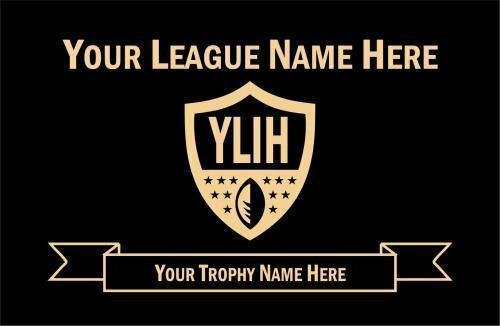 Includes header plate personalized with your league info (League Name, Custom Letters in Shield Logo, Banner Text). Comes with 18 individual plates for annual updates. Individual plate size is 1" x 2.5" and they are mounted to the base with 2 screws. Engraving of individual plates not included. See customization options when you add to cart to view engraving options.